Seth MacFarlane the creator of the animated sitcoms Family Guy, American Dad and The Cleveland Show, for which he also voices many of the characters, has started his new season of Family Guy, which is great for all the simple and clever jokes and for going against everything and everyone. And he also started his new show “The Cleveland Show” that hasn’t been as good as the other sitcoms, but it has just started with 3 episodes and more to come, lets hope he gets it on the right track. 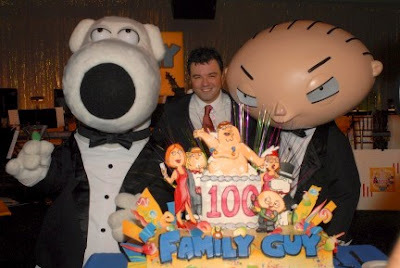 With great DVD sales and established fan loyalty, Family Guy developed into a $1 billion franchise. On 2008 MacFarlane reached a $100 million agreement with Fox to keep Family Guy and American Dad until 2012. The deal makes him the world's highest paid television writer. Anyway he is a great comediant and we hope to see a lot more of the good work he’s making. For now we can enjoy the new season of the shows and his appearences in other events.